Today we are sharing a few of our favorite items for the holidays, which are fast approaching and we can hardly believe it! These 5 things are for yourself to have on hand. They make the holidays just a bit more fun, a little easier and all the more personal. More Than Paper has a wide selection of these items, be sure to check them all out! Holiday Address Stamp: What you put in your envelope is special, shouldn't your envelope also be special? Even more than that, a return address stamp makes getting through all those holiday cards much easier. More Than Paper has a huge selection of holiday address stamps, we love this one by PSA Essentials, but shop all of them here. Gift Stickers: Gone are the days of going to the drug store for those icky labels. These personalized gift stickers are affordable and look great on packages! Shop all of our gift stickers here, we have hundreds from which to choose. Gift Tags: Many people prefer the look of gift tags to gift stickers. If you are one of those people, check out our huge selection of hanging gift tags. They tie right onto packages (or bottles of wine) beautifully! Don't you love this whimsical tree gift tag? 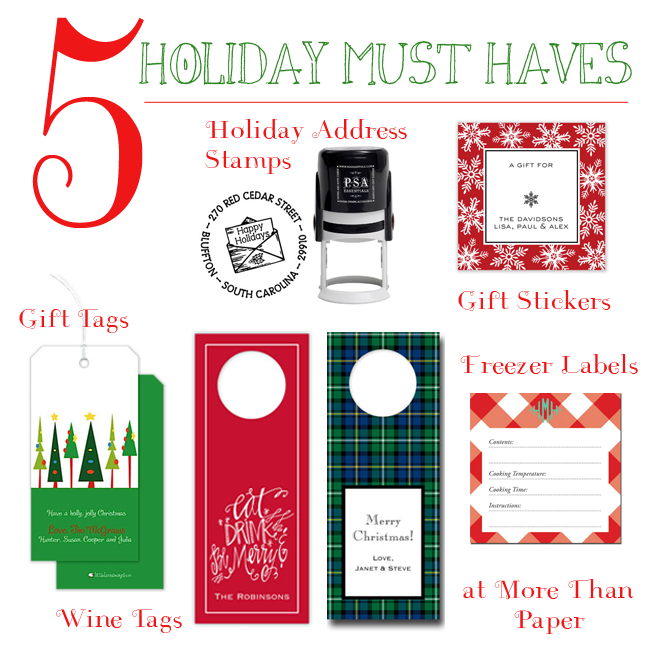 Wine Tags: Are you headed to a lot of dinner parties or holiday parties this season? Stock up on a case of wine and order yourself some personalized gift tags like this "eat drink and be merry" or "Merry Christmas" plaid one. Right before you head out to a party, grab the wine and a tag and you have an instant personalized gift. We love the ones that have room to write messages. Shop all of our wine tags here. Freezer Labels: You may think this one is strange or doesn't belong. Sure it's a little luxury to have a personalized freezer label, but if you are planning on doing a lot of baking or meal preparation for neighbors, co-workers, friends, as thank yous, and as hostess gifts -- a personalized freezer label dresses up your meal and makes it a little more special, and more personal! We love this one by Whitney English, or shop all of Whitney's freezer labels here. Let us know what you think of our holiday must haves and if you'll be stocking up! Happy Holiday Shopping from More Than Paper! The holidays are an ideal time for gifting holiday cards to the loved ones. Small toddlers loves the most to be gifted personalized gifts by some loved one. Today, various types of personalized holiday cards are available that provide a unique way of gifting to friends and families for Christmas, Thanksgiving or Hanukkah.